I can't... I'm not good enough... I'll never find what I want... How often do you consider the strain these negative and limiting statements have on your mind, choices, and life? The persistent messages you repeat can frame your thoughts and trap you in a mind-set that can be difficult to break. Whether you realize it or not, the words you use are the architects of your life. 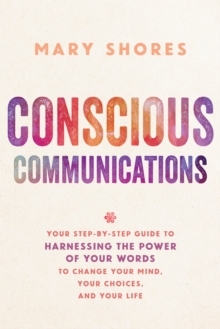 After years of personal experience and research, entrepreneur and communications specialist Mary Shores realized that there is a life-changing theme persistent throughout ancient traditions and spiritual foundations that is also supported by scientific professionals. They all agree on one recurring truth: Words have the power to create andtransform. Armed with this knowledge, Mary created easy-to-follow, step-by-step practices to teach you how to launch yourself to the next level. - Discover the 3 pillars of transformation: focus, beliefs, and taking action- Break through your barriers- Learn the power of choosing moment to moment how you portray yourself in the world- Set goals to inspire your brain and body to campaign for success- Create your own customized action planConscious Communications is your guide to creating a life in alignment with your dreams and desires. With thoroughly tested exercises, research, advice, and personal stories, you will begin to experience the tremendous impact of words and how to utilize the right ones to unleash and unlock the power to create a new reality.